With the acquisition of the Oculus Rift headset, Facebook appeared ready to corner the market of the new virtual reality market. But at its annual I/O conference, Google declared that it was staking its own claim. At the end of the search giant’s keynote address, Sundar Pichai announced that everyone in attendance would get a nondescript cardboard package, but was coy about its contents. Turns out, it’s the firm’s attempt at a do-it-yourself VR headset. Known as Cardboard, copies of the headset were handed out as part of a goodie bag, alongside the choice between a brand new LG G Watch or Samsung Gear Live smartwatch. Intended to be a do-it-yourself starter kit, Google Cardboard is a head-mounted housing unit for your smartphone that lets you blend everyday items into a VR headset. With a $10 lens kit, $7 worth of magnets, two Velcro straps, a rubber band, and an optional near-field communication sticker tag, you can have your very own VR headset for the fraction of the price. You can use household materials to build one, and a rubber band to hold your smartphone in place on the front of the device. Assembly instructions, plans and links for where to source the needed parts (like lenses) — as well as an SDK — are available on the project’s website. Google hopes that by making the tech inexpensive (unlike offerings from, say, Oculus), developers will be able to make VR apps that hit a wider audience. According to some early reviews, the entire virtual reality experience is surprisingly intuitive, and is as impressive considering how simple it is. And while the quality doesn’t quite match the Oculus Rift’s dual OLED Full HD screens, and it is lacking in that it doesn’t have positional tracking (meaning you can’t lean into something the way you would in real life), the Cardboard is able to create the 3D effect using just a single phone screen and some specialized lenses. Meanwhile, Google has created some great demos within the Cardboard app, showcasing the kind of experiences people can expect moving forward. Right now, the Cardboard app features simple demonstrations: Google Earth, Street View, Windy Day, and more. But it’s just a small taste of what’s possible. 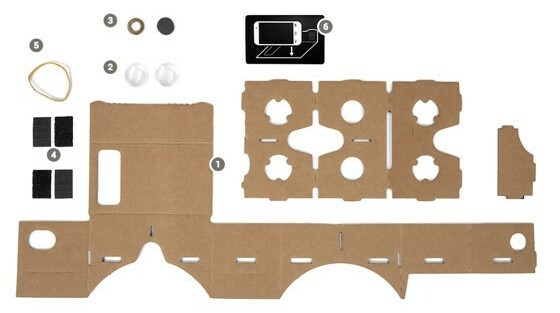 And anyone willing to put some time into putting together their own cardboard headset can get involved. Never before has virtual reality been so accessible, or cheap. And that was precisely the purpose behind the development of this device. Originally concocted by David Coz and Damien Henry at the Google Cultural Institute in Paris as part of the company’s “20 percent time” initiative, the program was started with the aim of inspiring a more low-cost model for VR development. After an early prototype wowed Googlers, a larger group was tasked with building out the idea, and the current Cardboard headset was born. Beyond hardware, on June 25th, the company also released a self-described experimental software development kit for Cardboard experiences. Cardboard also has an Android companion app that’s required to utilize Google’s own VR-specific applications, called Chrome Experiments. Some use cases Google cites now are flyover tours in Google Earth, full-screen YouTube video viewing, and first-person art exhibit tours. Looks a lot less clunkier. And I doubt you’ll bump into your surroundings with it. Truly revolutionary product, it looks so easy and amazing to use.